Harman Kardon has launched the ONE and Esquire 2 premium wireless speakers in India. The Harman Kardon ONE is priced at Rs. 14,990 and offers up to five hours of playback time. The speakers also comes with HTC Connect Technology that allows HTC smartphones to be paired easily. The Harman Kardon Esquire 2 is priced at Rs. 19,990 and offers VoiceLogic noise and echo cancelling technology. The rechargeable battery in the Esquire 2 offers up to eight hours of playtime. 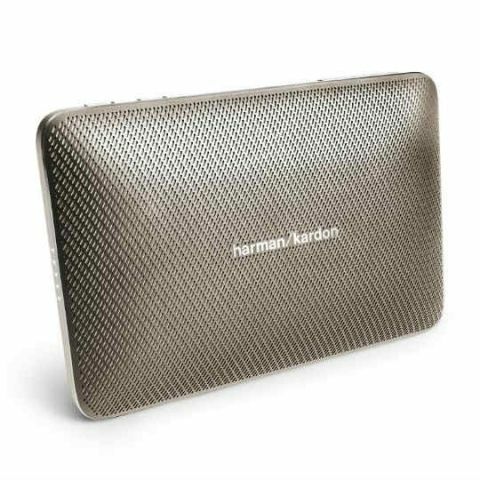 HARMAN, the premier connected technologies company for automotive, consumer and enterprise markets, has launched the premium wireless speakers- Harman Kardon ONE and the Harman Kardon Esquire 2 in India. The elegantly-designed, wireless audio systems are a perfect combination of style and sound quality. The sleek, ultra-slim Esquire 2 is crafted out of premium material on the outside and pure Harman Kardon sound engineering inside. What sets this speaker apart from its predecessor is its unparalleled teleconferencing system with quad-microphone VoiceLogic noise and echo canceling technology and 360-degree voice pick-up which provides crystal clear conference calls anywhere. The speaker also has enhanced bass ports for a richer soundscape and a rechargeable battery which supports up to eight hours of playtime. The 16W speaker also has a USB charge out which ensures travelling professionals’ smartphones and tablets never run out of power. Available in graphite, black or champagne, this speaker makes a stylish addition to any office or conference room, and easily fits into a briefcase or handbag for the on-the-go professional. For those looking for rich and impressive sound, the Harman Kardon One offers 2 x 6W stereo Bluetooth streaming and comes equipped with HTC Connect Technology, which makes it extremely easy to pair with an HTC smartphone. Lightweight and travel ready, it allows users to make crystal clear conference calls anytime, anywhere, and its rechargeable battery supports up to five hours of playtime. The products are available on www.harmanaudio.in as well as in HK Sound Lounges around the country.